If you purchased the optional Ethernet kitchen printer, you also need an Ethernet Internet connection (e.g., cable modem, router, and Ethernet cable). If you haven’t already, download Square Point of Sale from the Google Play to your Galaxy Tab. Make sure there are two free output ports on your router to plug things in. Keep your receipt printer close to the router for easy setup. Head into the Wi-Fi settings in the Settings app on your Galaxy Tab. Choose your router’s network and wait a few seconds for the signals to communicate. If you’re having trouble connecting, unplug the router’s power cord and Ethernet cable, then plug everything back in. Use the provided L-shaped hex key to unscrew the top two screws on the face of the WindFall Stand. Slide the Galaxy Tab inside and refasten the screws to keep it in place. Make sure the Galaxy Tab’s headset jack is on the right. If you purchased the security lock, wire, and anchor point, go ahead and get things locked down. Superglue the anchor point to your device, slip in the lock, and then loop the wire around a fixed point and attach it to the lock. Use the included micro USB cable to charge your Square Reader for contactless and chip. Connect the micro USB end to your reader, and the other end to a computer or outlet using a USB power adapter (sold separately). Once it’s charged, press and release the button on your reader to turn it on. Go to settings on your device and make sure Bluetooth is turned on. Open your Square app and tap the three horizontal lines to access the Settings menu. Tap Settings > Card Readers > Contactless + Chip Reader. Put your reader into pairing mode by pressing the reader’s button for 3 to 10 seconds. Remove your finger as soon as you see orange flashing lights. Note: If you see red flashing lights, you’ve held the button for too long, and you need to try again. When connected, the reader will be listed as Ready. To connect your Square Reader for magstripe, simply plug it into your Galaxy Tab’s headset jack. Connect one end of your printer’s Ethernet cable to your printer and the other end to one of your router’s output ports. Plug your printer into a power source, then switch on the power button. Place your receipt printer on the counter next to your WindFall Stand. 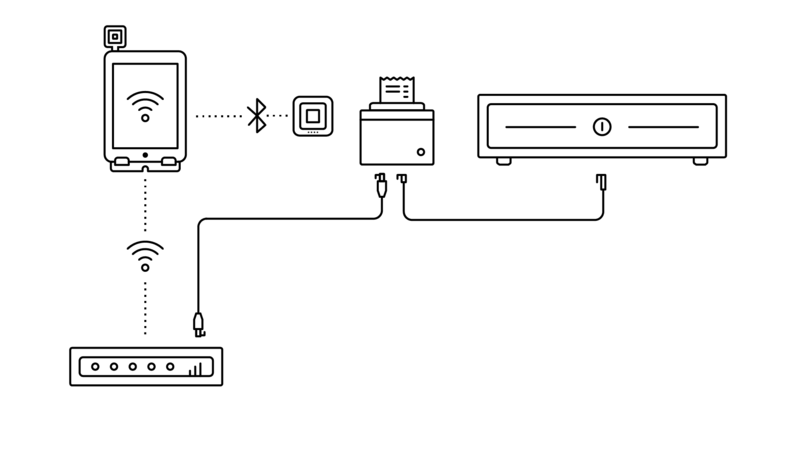 Just as your did with the receipt printer, connect one end of the Ethernet cable into your kitchen printer and the other end into another of your router’s output ports. Plug your printer into a power source, then switch on the power button. Lift the lever on the top-right side of your printer, open it up, and rest the printer paper inside. The trick is to keep the roll underhand, leave a little slack, and then shut the top with some paper sticking out. Once you get a solid green light, it’s good to go. Take the interface cable (labeled CD-014A) from the cash drawer packaging. The larger end plugs into the bottom of your cash drawer, and the smaller end plugs into the DK port on the back of your receipt printer. Your Square app is designed to automatically open the cash drawer after every cash sale. Or you can use the included manager keys to manually open the cash drawer. Open your Square Point of Sale app. Tap the three lines on the bottom left to access the Settings sidebar menu. Tap Settings > Printers. From here, you’ll see all available printers. Select your printer from the list and make sure to turn on Receipts, Order Tickets, and/or Order Ticket Stubs. Then tap Cash Drawers, select your cash drawer, and tap Test Cash Drawer to make sure it pops open automatically. Boomtown can send a local technician onsite to set up your Square hardware and network, and provide technical support for your business. Visit www.goboomtown.com/square-support or email sales@goboomtown.com for a free consultation.